This article first appeared on The Write Burgess Taylor. For several years now I’ve struggled with finding a my own core planning system. I had one, once upon a time, in what feels like another world when I worked a seven AM to six PM job/50+ hours a week–it was simple. For work, I used a legal pad that I made a daily running master list of to-do’s for the day on, a large desk calendar that I wrote any and all appointments, events, and anything else that was date sensitive. I used sticky notes for things that weren’t date specific. And for home (anything personal, family, and home related) I had a pocket calendar I carried in my purse, and a wall calendar at home that hung on the wall in the kitchen for the important things like bills, birthdays, doctor appointments, school things, and anything else that might be relevant. It wasn’t fancy. Well, some of the wall calendars actually had either beautiful images, adorable pictures, or cartoons that made me laugh, but it worked–for a long time it worked well. However, my planning system stopped working when I stopped working outside the home because I didn’t feel like I needed a planner or a planning system. Not really. The calendar worked just fine back then because I wasn’t busy. All I had to keep with were basic things like bills, birthdays, and appointments. 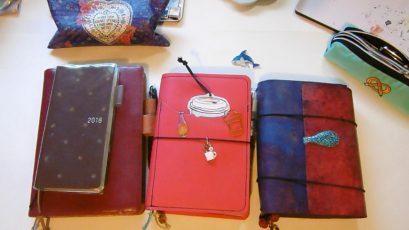 But I fell down the rabbit hole of all things journal related once I started watching and then creating videos on Youtube, and right around that same time I got busy. Busy creating content. Busy writing a novel. Busy keeping up with David’s schedule. Busy keeping up with house stuff, video stuff, and all kinds of other things. Thus, I needed a planner. I have stumbled on my journey, taken one too many U turns, gotten lost a few times, but I haven’t given up. I keep trying, and then it hit me the way the enabling hits you when you watch a video on Youtube and that new shiny fancy thing lights up the whole screen of your computer and before you know it you’ve clicked the purchase button for a new notebook, fountain pen, traveler’s notebook, planner, watercolor set, marker set, or (watch out wallet) all of the above–I needed help. I signed up for Ali Brown’s Plan Your Peace course. From the introduction to the very last video I found myself nodding, laughing, shaking my head… It hasn’t fixed all of my issues but it has really helped me with some of the things I have been doing wrong (I’ve got to stop doing that stuff), some of the things I’ve been doing right (I need to keep doing more of that), and it helped me see that I’m not going to fix my issues with planning overnight, but I am doing better. I admitted to myself (finally) that I really need to get better about reviewing (daily, weekly, monthly, quarterly, yearly). My goals need more actionable steps, and I need to hold myself more accountable. It’s been an expensive ride towards finding a planning system that works for me, but I don’t regret it. As a matter of fact, as I write this I realize how much I’ve learned about myself as an avid journaler, a work in progress planner, and a creative. I know that I need function and creativity. I also need a calendar, to be able to see ahead (future planning), as well as somewhere to make lists (daily, weekly, monthly, quarterly, and yearly), and I’m much more of a rapid logger, brain dumper, and collection collector than I realized. Merging a calendar based planning system with the bullet journal is much more my cup of planner coffee. I have been trying to force myself to use the Hobonichi Cousin for planning but it’s not meant to be a planner for me–it’s meant to be more a daily journal for me. Shut the front door! Sounds like blasphemy to me too, but it’s the truth. The moment I typed those words I knew they were the truth. I’ll be signing up for Enthusiastically Dawn’s Planner BootCamp this weekend. I’ll let y’all know how that goes as well… so more “Finding my Way to Planner Peace” videos and blog posts to come. Hey y’all. 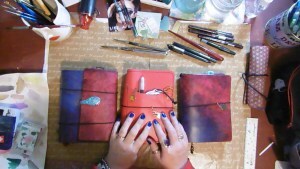 I’m a writer, an artist, an avid journaler, a DIY’er, a coffee addict, and this is my website. I live in South Carolina and have a wonderful husband I affectionately call Mr. Rockstar, a gorgeous grandson we call Mr. Viktor, and I love writing, reading, or creating art to the sound of rain. 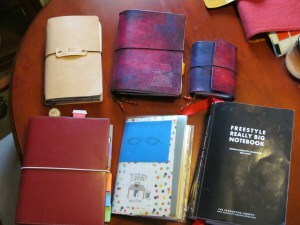 I’m most often found in my creative room with coffee in hand, doodling in my Hobonichi or Art Journal, or writing in my Writer’s Bible/Traveler’s Notebook (a Jonelifish). Grab a cup of coffee (or tea, if that’s your preference) and let’s sit for a spell. You can find me on my YT channel, my website,Twitter, and Facebook. I have a hobonichi original and a weeks and neither are really used for planning. I record on them what’s happened that day. As for planning I have a VERY minimalist version. I just write what needs to be done in a list with a little box next to it. Checked: done. Arrow: still needs to be done. Thanks for this article- I always inspire me! YOU ALWAYS INSPIRE ME, dammit. I need to proof read before posting…. You weren’t the only one. I also bounced around testing out various systems until I figured what I actually needed. I have the perfect set up now, and if I had to, I can use it in any sort of planner layout. I know what I need.